They may be too little to trick or treat, but these babies aren't missing out on the Halloween fun. When you're the mom of a premature baby, time starts to feel a little unreal. Days, weeks and in some cases, months pass by without you noticing birthdays, holidays, or really, anything. The only focus that has a metric of time? How much weight your baby is gaining. How they're recovering from surgery. How many days until you get to hold them for the first time or they finally are big enough to hold their own in a onesie. That's why this (incredibly!) sweet gesture by March of Dimes has us silently tearing up. As a way to make sure new parents actually celebrated the spookiest time of year, they teamed together with the staff at St. Luke's Hospital in Kansas City, Missouri to provide Halloween costumes for the premature babies. No cute puppies or soft duckie get-ups though. Instead of playing off the small factor (which, hey, is probably a touchy subject for these parents), they picked superman and superwoman costumes to empower the babies (even if they don't register it yet) and to build hope for their family. In addition to the ridiculously adorable costumes, the group also gave the families a footprint keepsake, a children's book, and a pumpkin crochet to 35 babies in the neonatal unit. And as if that wasn't already enough, volunteers also recruited photographers to capture the festivities, and for many families, it was the first professional photo they took with their child. 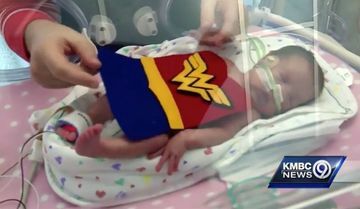 One father, whose wife gave birth at only 27 weeks earlier this month, summed up what it meant to the parents perfectly: "It means quite a bit to know somebody actually took time to make the costumes and make the treats and try to create some kind of normalcy for her being in the hospital like this," Brandon Nieder told KMBC News. Trick, treat or tug at our heartstrings? All three! Superhero costumes for the win!